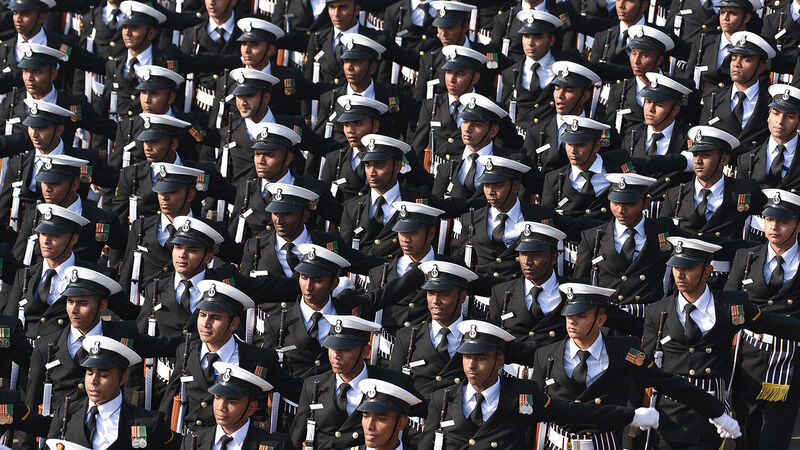 Indian Navy contingents march during the 70th Republic Day Parade at Rajpath, on January 26 in New Delhi, India. With a population of 1.3 billion and a strong military, India is almost certain to join an alliance with Russia and China. India signed a $3 billion contract to lease Russia’s Akula-1 class nuclear-powered attack submarine for 10 years on March 7, ignoring America’s threats of sanctions and showing that it places a higher value on its alliance with Russia and other regional powers. An agreement was reached between Russia and India after six years of negotiation. Called the Chakra iii by the Indian Navy, the Russian Akula-1 class submarine will likely be delivered to India by 2025. The Chakra iii will be India’s third Russian-acquired nuclear attack submarine. This submarine will replace the Indian Navy’s ins Chakra, another Akula-class submarine leased from Russia in 2012. India acquired its first nuclear attack submarine from Russia in 1988, which India held until 1991. By signing another weapons deal with Russia, India is ignoring the U.S. The Countering America’s Adversaries Through Sanctions Act (caatsa) prohibits America’s traditional allies (like India) from purchasing military technology from Russia. This law requires the U.S. to levy economic sanctions on India for making the deal with Russia. In October, India signed a $5 billion deal to purchase five Russian S-400 missile systems. The U.S. warned India that such a transaction would result in economic sanctions. But India is clearly willing to sacrifice its relatively new relationship with the U.S. in favor of its long-standing partnership with Russia. After the collapse of the Soviet Union, relations between Russia and India remained warm and developed into a “special relationship.” In 2000, the leaders of both nations signed the Declaration on Strategic Partnership Between the Republic of India and the Russian Federation, which produced unprecedented levels of cooperation in defense, economy, technology and security. Russia became India’s largest weapons supplier. In 2010, Russian President Vladimir Putin upgraded the relationship to a “special and privileged” strategic partnership. When Russia forcibly annexed Crimea from Ukraine in 2014, the West protested, but India supported Russia. In 2015, India became the world’s largest importer of armaments with most of those imports coming from Russia. From 2009 to 2013, Russia supplied roughly 75 percent of India’s arms imports. Many signs today show that global power is shifting from West to East. India has been a key part of that shift, and if it continues to cooperate with Russia and China, it is likely to take on an even greater role. This passage in Ezekiel goes on to list “Ethiopia, and Libya … and many people” being allied with Russia and China (verses 5-6). Ethiopia and Libya should be translated “Cush” and “Phut.” Although portions of the tribes of Cush and Phut migrated to African nations, the rest settled in areas of India. The context of this passage shows that it refers to modern-day Indians (and perhaps Pakistanis) rather than African peoples. With its robust military and economic ties to Russia and improved relations with China, India will be incorporated into this kings of the east alliance. To understand more about India’s role in this biblically prophesied Asian alliance, please request your free copy of Russia and China in Prophecy.